Okay, okay, so technically this is a Monday morning update, but shhh. It'll be our little secret. 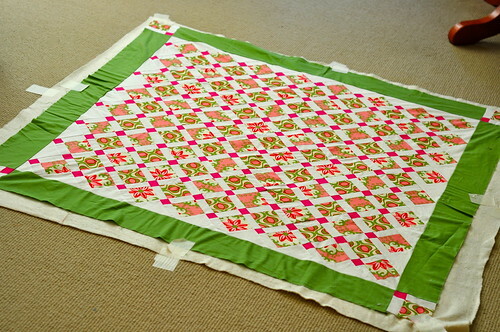 From last week's list I managed to finish a few key projects, but the one I am the most excited about is George's quilt. Honestly I'd been hemming and hawing (or perhaps hawing and NOT hemming) about stitching just three feet of hand-quilting, so tonight I finally just rolled my eyes at myself and finished it. YAY! Another accomplishment? Finishing the quilt for my niece Sissy. I machine quilted it, but I hated it pretty much the entire time. Even with a walking foot I felt like the stitches were uneven and bodgy. I love hand-quilting so much. For J3's quilt top (67" square) I am probably going to spring for professional machine quilting. Tonight for Sissy's quilt I finally chose the binding and attached it, and except for four lines more of stitching it is DONE! I'll be able to post it on Friday to my tiny, excited niece! This is what it looked like all taped, but not yet basted or quilted. 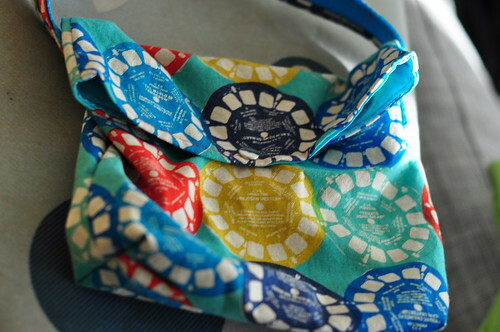 Also I made her a matching Viewfinder bag! She specially requested one just like mine. I was only too happy to oblige! I'm feeling obviously super chuffed. I'm sad to say I got very little writing done. I need a good nap day so I can sit down and diagram the story. I used to go through phases, where I'd write a lot, then I'd stop almost completely and sew a lot...I think I'm on a sewing upswing at the moment. But I need to get back to writing. Boo for me. Please go visit my store for updates, and I will try and include new stuff every couple weeks. Here's to a happy, busy week!